Another comfort position option while touring! 1069A: Give your left foot a little extra room. 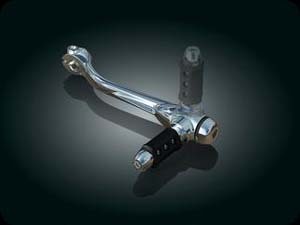 Folding Heel Shifter permits the rider to move the rear shift peg out of the way when on the open road, while retaining heel/toe shift functionality around town. 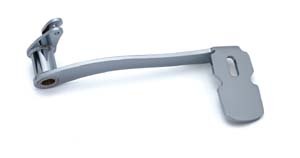 Positive detent holds the peg in the selected position. Easy to install. 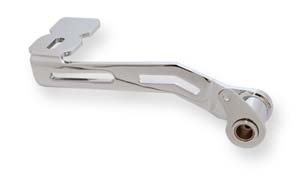 Replacement rear lever is chrome-plated, and shaped to match the Original Equipment toe shift lever. 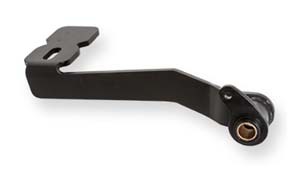 Lever accepts stock or accessory shifter peg. 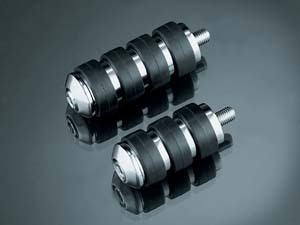 8004, 8021: Finish off your set of pegs or replace existing stock shift pegs with the ISO-Shift Pegs. The standard model is stock-like in size; the Longhorn has one more O-ring and is 5/8" longer (great for extended controls). Vibration isolation. 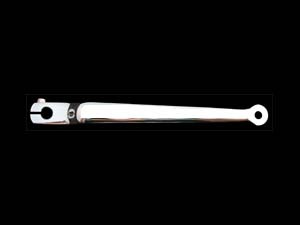 1045: This premium quality accessory quickly and easily allow you to remove the heel shift lever on Dressers or Road Kings. Unique design keeps the shift shaft in perfect alignment to avoid premature shaft wear, a problem common to similar products. The Delrin® lining eliminates rattles and keeps your bike shifting as smoothly as ever. Fits: ''80 to '09 Electra Glides, RoadGlides, Street Glides, Tour Glides, & Road Kings (ea). 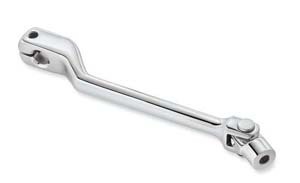 EL-1026: Extended Girder Shift Lever: With an 8" length, it is about 1-3/4" longer than a stock FLT or FLST shift lever. 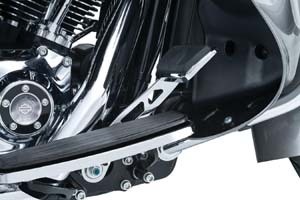 It works as both front or rear on footboard equipped Harleys. This chrome beauty will give you a lot of additional room on the footboard. 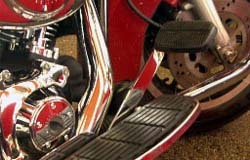 Fits Heel or Toe on '83 to current Electra Glides, Road Glides, Street Glides, Tour Glides, Road Kings; & all '86-'09 FLST Models. 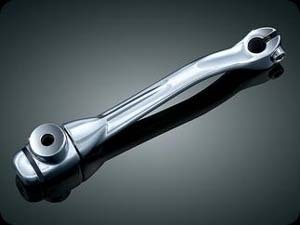 EZ-1000: Extended Shift Lever. Repositions the Shift Lever up and forward for maximum foot room. EZ-2000: Similar to above but for front and back. 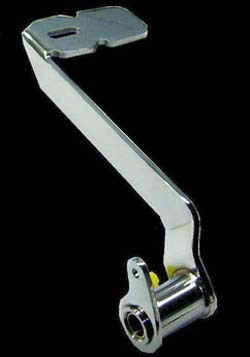 EZ-ELIM: Spring-loaded spacer replaces the Heel Shifter and repositions the Toe Shifter to the outboard end of the shaft. 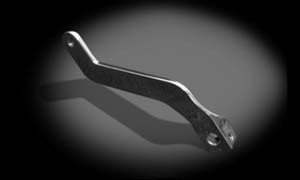 EZ-SP: Reduces shift linkage free play when using both Toe and Heel Shifters. Note: Touring models only. Comfort: There's no reason to sacrifice comfort for style. 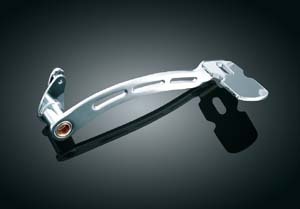 These Levers for Brakes ensure that long rides are comfortable and easy and not at the expense of style. Your bike will ride better and look great. Safety: There's no question these products may make your ride safer. Engineered to be ergonomically superior to the factory standard, they are more responsive, and reduce fatigue. This is particularly true during long road trips. Style: Whether you order your part in Chrome Powder Coat or Anodized Black, these American made babies are built to last and look great doing it. We have styles available to match any model, any year and every attitude. 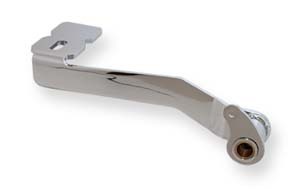 SB-EXT-BL: Brake levers are up to 20 degrees lower also has wider offset for clearance on the Lower Fairings. Available in 1" or 2" extended lengths. This product included floorboard bracket spacer kit or a spacer kit that moves the brackets out if needed. These floor board spacer kits fits from 2009 to Present. 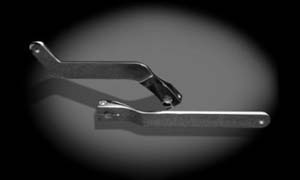 The floor board spacer kit moves your stock running boards out 3/4″. Kit includes hardware to do both sides of the bike. Chrome or black. 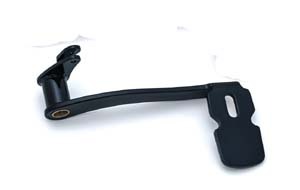 EL Extended Brake Levers: The answer to more leg room on floorboard equipped H-D Models! 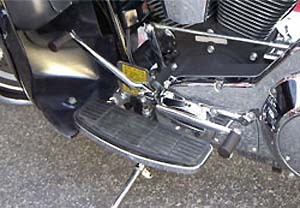 Levers move the location of the brake pedal pad while flattening the angle of the pad. 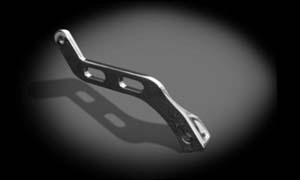 Amount of extension varies depending on application, but the result is that your foot is no longer “under” the brake pedal, making braking easier and more natural. 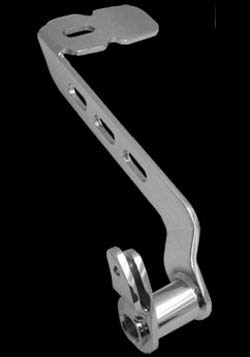 All levers are beautifully polished and chrome-plated or powder-coated steel. 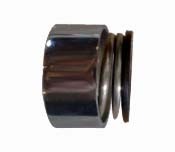 They have a bronze bushing with a grease fitting for smooth operation and long life. 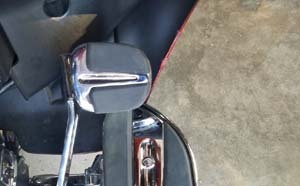 EL-2014S: Extended Brake Pedals are the best solution to providing extra room and more natural rear brake operation for Harley-Davidson Touring and Trike models. 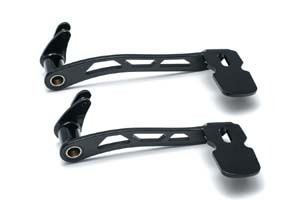 xtended Brake Pedals for models without fairing lowers are noticeably longer than stock and place the pad location at a lower and flatter angle for easier rider operation. 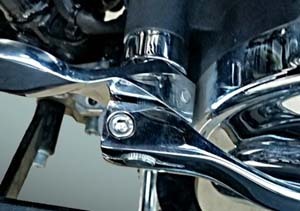 Extended Brake Pedals for models with fairing lowers are essentially the same length as stock to avoid interference, but the angle of the pad location has been lowered and flattened for more neutral positioning, making it easier for the operator to engage. EL-2014B: Similar to above but slotted in gloss black. EL-1027: Chrome, slottted. 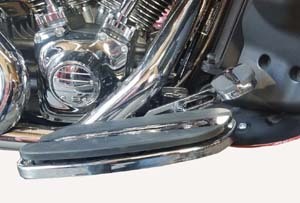 Fits: '97-'07 Electra Glides, Road Glides, Road Kings & Street Glides; '87-'16 FL Softail Models. 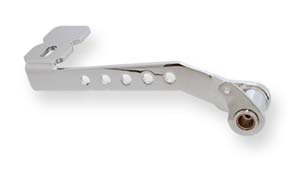 On '02-'07 Models our extended Brake Pedals provide slightly more extension than stock but the Brake Pedal Pad is lower & flatter, making the transition from board to brake more neutral. EL- 9061: Chrome. 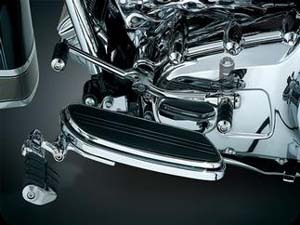 Fits: '97-'07 Electra Glides, Road Glides, Road Kings & Street Glides; '87-'16 FL Softail Models. 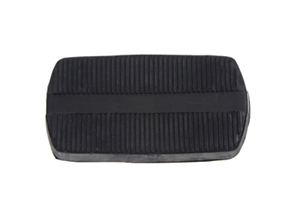 On '02-'07 Models our extended Brake Pedals provide slightly more extension than stock but the Brake Pedal Pad is lower & flatter, making the transition from board to brake more neutral. EL-1071: Chrome. 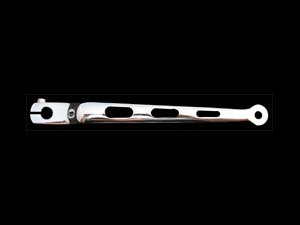 Fits: '08-'13 Electra Glides, Road Glides, Road Kings, Street Glides & '09-'13 Trikes. EL-9672: Chrome. Fits: Following Models With Fairing Lowers: '14-'16 Electra Glides, Road Glides, Road Kings, Street Glides & Trikes. Not compatible with Ergo Guards. EL-9673: Gloss Black. 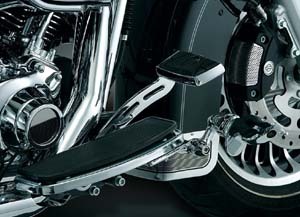 Fits: Following Models With Fairing Lowers: '14-'16 Electra Glides, Road Glides, Road Kings, Street Glides & Trikes. Not compatible with Ergo Guards. EL-9670: Chrome. 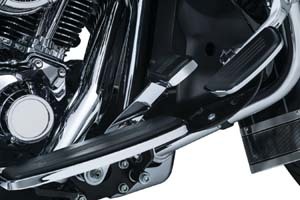 Fits: Following Models Without Fairing Lowers: '14-'16 Electra Glides, Road Glides, Road Kings, Street Glides & Trikes. Not compatible with Ergo Guards. EL-9671: Gloss Black. 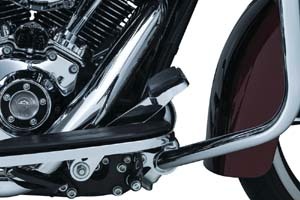 Fits: Following Models Without Fairing Lowers: '14-'16 Electra Glides, Road Glides, Road Kings, Street Glides & Trikes. Not compatible with Ergo Guards. 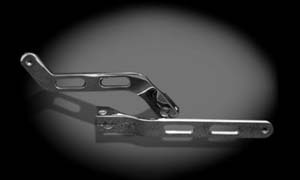 EL-SL2: Made of the highest Quality Steel and Chrome. 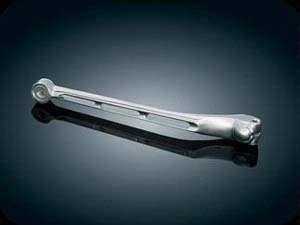 The EL-SL2 are designed to match the stock ones found on the bike except they are ~8 inches long. 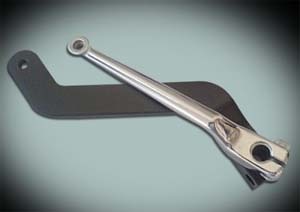 The design tightens up the size of the Spline hole to eliminate Spline stripping and play in lever. By changing out the back heel shift you free up the board to have full use of it and which allows for much more comfort on the left side. EL-SL2B: Same as above but with slotted styling. EL-SC1: Bullet Spline Cover. For those who don't use the heel shifter and want to eliminate it. 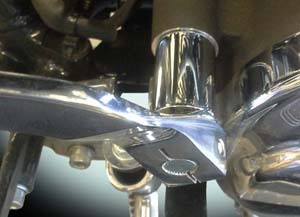 EL-BL: Extended brake levers. 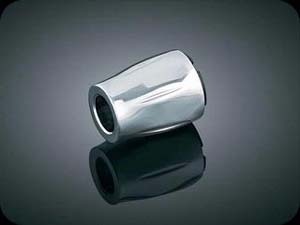 It all starts with the finest steel and welds as smooth as glass, followed by the highest polished chrome. Our Extended Brake Pedals offer the best angle at the brake pad to give you the Fastest, Safest and most comfort Available. We have moved the Brake Pedal off the board and set the angle to give you the ability to slide your foot forward to get maximum braking and comfort. No more having to go around the stock pedal and having to lift you foot up to stop. We have also moved the brake pad position out 1/2 inch to keep the air cleaners from getting in the way while braking. Tired of having your foot cramp up? Install our pedal and enjoy the comfort of what a floorboard was made for!